ORLANDO -- In a fast-paced, increasingly diverse culture where Christian churches of all denominations struggle to continue making disciples of Christ, United Methodists face challenges reaching almost any audience you could name. But has the Florida Conference done enough to nurture black congregations in a state with a high population of African-Americans? And what more could be done? About 60 pastors representing nearly 70 congregations across the Florida Conference turned out Monday to ponder that question at a gathering called “Black Clergy Conversation with the Bishop,” organized by Rev. 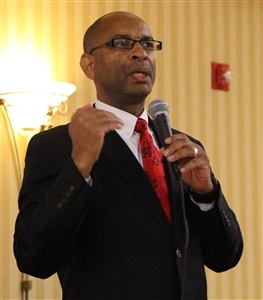 Harold D. Lewis Sr., director of Multicultural and Justice Ministries for the conference. 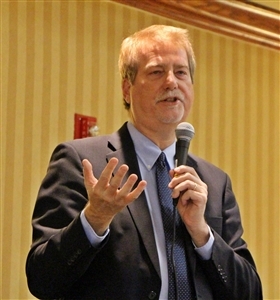 Lewis characterized the meeting as the “beginning of a dialogue” to discuss how the organization, institution and system of the Florida Conference affects the growth of churches that serve predominantly African-American flocks. Among issues voiced by those attending were a shortage of new black church plants in comparison to church starts intended to serve other segments of the population, lack of support for new black preachers and lack of investment in new technology for African-American congregations trying to appeal to young people. Florida Bishop Ken Carter told the group that he knew, despite sharing some similar experiences as a preacher, he could never fully understand the challenges and frustrations of African-American pastors in Florida’s United Methodist Church. “Yet I do feel called to try to move to a new place and try to create something together,” the bishop said. The bishop outlined plans to partner with Black Methodists for Church Renewal, the church’s organized black caucus, and Strengthening the Black Church for the 21st Century (SBC21), a General Board of Discipleship (GBOD) program that includes an intentional focus on laity. Carter said he also has a verbal agreement with bishops of the Mississippi and South Carolina conferences to work together to bolster African-American churches. That effort may include cross-appointments of clergy across conference lines and welcoming to Florida a satellite campus of a large African-American United Methodist church from outside the state. Although Florida counts more than 3 million African-Americans in its population – nearly three times that of either of the other two states – Mississippi has the most African-American churches of any annual conference and South Carolina has the most African-American members, Carter said. Rev. 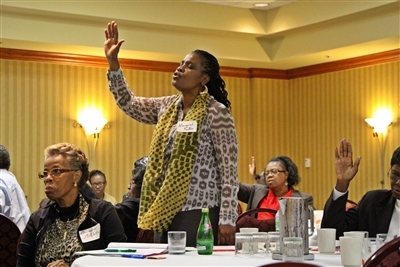 Margaret Kartwe-Bradley, center, pastor at Sellers Memorial UMC and Kelly's Chapel, Miami, lifts her hand in praise during musical worship provided by Solid Rock UMC, Orlando, at the Black Clergy Conversation with the Bishop. Photo by Susan Green. Ideas he outlined for nurturing future leaders included strengthening ties with United Methodist-affiliated Bethune-Cookman University, a historically black school in Daytona Beach. Students interested in ordained ministry could be encouraged to go to Gammon Theological Seminary in Atlanta, which offers an African-American culture, and also be paired with clergy mentors, the bishop said. He also reminded the group that last year half the Annual Conference offering was set aside for a program to cultivate young clergy of color, and plans include appointing more young black associate pastors in vital black congregations where they can learn from successful lead preachers before taking the helm of their own church. If everyone in the room collaborated to work toward the goal, there could be 15 to 20 truly strong black churches in the Florida Conference by 2020, the bishop said. Some in the room said opportunities for black young adults were hindered in the Tallahassee area, which has a significant African-American population, when the Florida Conference stopped supporting a Wesley Foundation ministry at Florida A&M University. Others said the lengthy ordination process in The United Methodist Church is a hindrance to those of limited financial means, and Carter agreed. Reached for comment Wednesday about FAMU, Rev. David Fuquay, director of Higher Education and Campus Ministry for the Florida Conference, said by email that plans are underway to launch some form of ministry at FAMU by next fall. He said he and Rev. Dr. Bob Gibbs, North West District superintendent, have been connecting with key leaders in Tallahassee to help with the planning process. Lewis said after the presentation that a meeting similar to the Black Clergy Conversation will occur in February for lay members in leadership in Florida Conference black churches. Later in the year, clergy and laity will be invited to meet together to continue the collaboration. Also leading discussions during Monday’s event were Dr. Fred Allen, national director for SBC21, and Rev. Candace Lewis, executive director of GBOD’s Path 1 program, a collaboration of church planters, bishops and staff members from annual conferences and general agencies tasked with training leaders for new churches. Carter opened and closed his remarks at the event by thanking those in the room for faithfully preaching the gospel, despite obstacles and possible past slights.